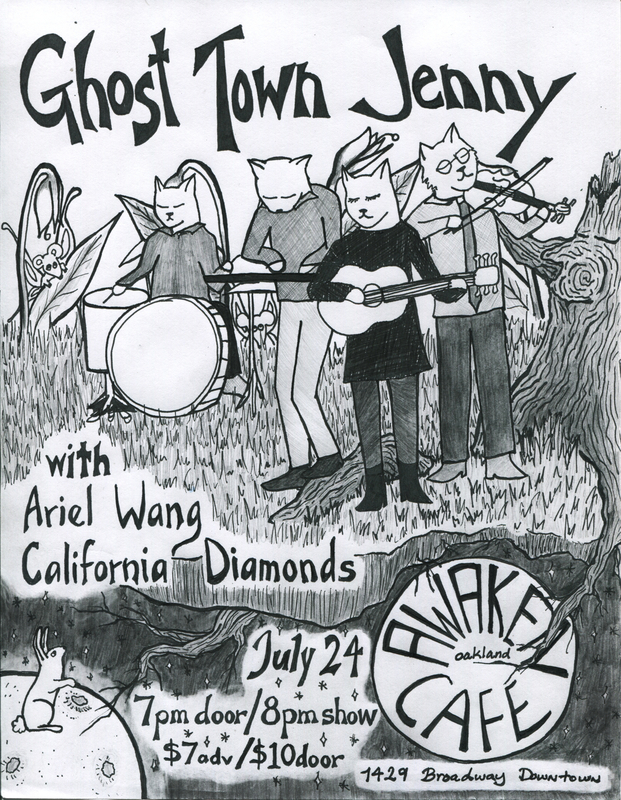 I spent yesterday with Kim of Ghost Town Jenny with every intention of putting up flyers for our show together at Awaken Cafe July 24, but instead we ended up having lunch and browsing many antique stores. Part of the magic of music is that it’s connected me to so many cool people, and lovely new friends – notice a theme on this blog here? It still continues to blow my mind. On another note of meeting cool people, I went to the Space Station to check out a house show (they do know how to do things there) and California Diamonds silenced the room with their beautiful harmonies and intricate guitar playing. I won’t say much more for now. At this show I’ll be showcasing new songs, and you will get to hear two other ethereal beautiful bands create moving music. I’ve been in my cat phase. Sometimes I’ve got my cat face, and I feel a little cat faze. In this intrepid space of my life the muse came, and so birthed the compositions in this new compilation of tunes. 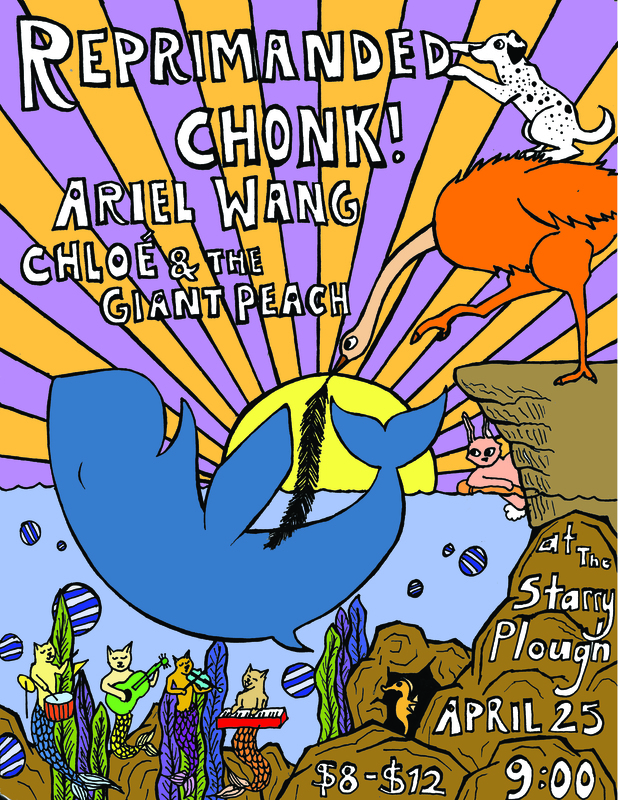 Before and since the first studio session with Jonah Strauss (Shipwreck Studio), much activity has influenced and culminated into what this EP release show (June 5th, at the Starry Plough) has come to be. – Lewis Patzner (Judgement Day, La Dee Da) and Harrison Murphy (Harry & the Hitmen, Sun Hop Fat) added cello and keys respectively, giving the songs a new flavor while staying true to their core. Some of the songs will be played live (and possibly the only time ever) in the same configuration as on the album. 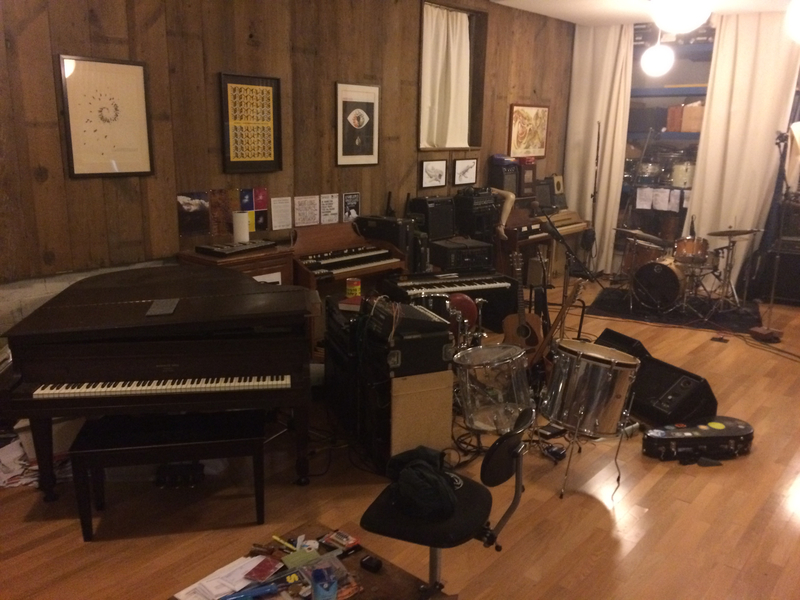 – The original Shipwreck Studio was destroyed by damages caused by a fire in the building which also killed two people (Donate to help restore Shipwreck here). The magic which has happened in this place, and for this EP, is stored only in memory. Don’t worry, Jonah is still recording though! – Terrell Liedstrand, although best known as the guitarist for rock hip-hop group Forrest Day, is also a talented songwriter, mandolin player, fiddler, banjoist, and beat boxer. His songs have lingered in many living rooms and forrest gatherings, and will open up the night. – I met my drummer, Melissa Killkuskie (Cave Clove), while playing violin for a live puppet show at a farm up north, and ended up house sitting for her when I was homeless many months back (the life of artists in the Bay Area have been tricky these past few years). This will be our charmed number third show together, and she’s keeping the band tight. 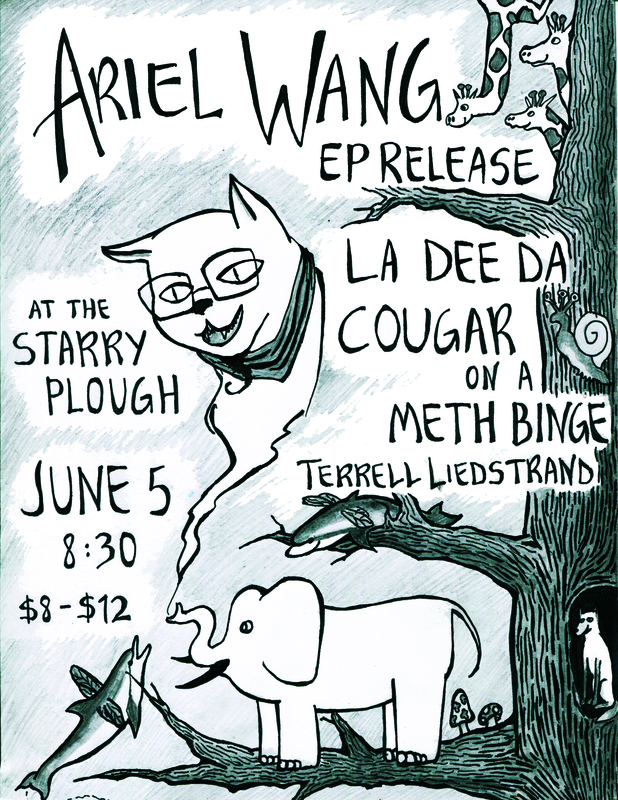 She also introduced me to Cougar on a Meth Binge, up and coming trip-folk band which will also be rocking the night. – The Starry Plough was my home pub for many years, and is where my entire music career began. My first experiences on stage as a singer-songwriter were at their tuesday open mics, and it is an honor to release my new EP at a venue known as a hub for all music, all ages, regulars, wanderers, drinkers, and thinkers. Come to the show and let’s party! This is going to be one hell of a year. 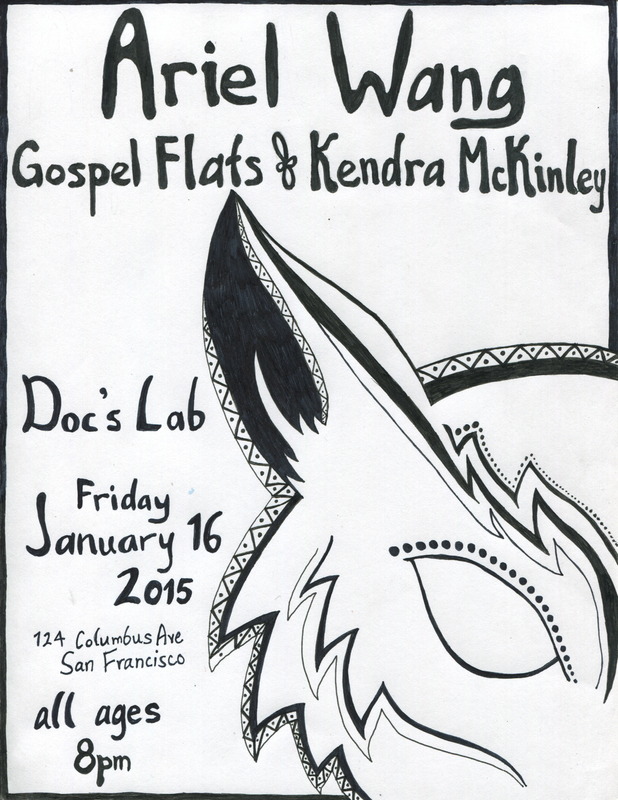 We’re kicking it off headlining at Doc’s Lab on January 16, with power woman Kendra McKinley and power duo Gospel Flats opening the night. I’ll be hitting the stage with old friends, Terrell Liedstrand (Forrest Day) and Harry Murphy (Harry & the Hitmen, Sun Hop Fat), as well as new, Nick Nirva and Melissa Killkuskie (Cave Clove). 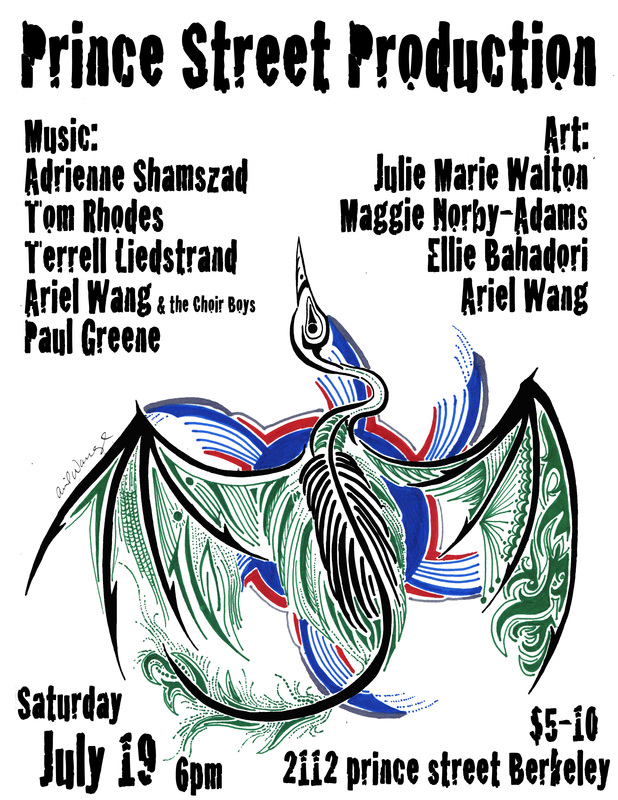 Then, it’ll be studio time at Shipwreck working with the brilliant Jonah Strauss. I’ll be lucky to have both Terrell Liedstrand and Lewis Patzner (Judgement Day, La Dee Da) backing me up. Keep an eye out for a planned EP Release show this summer! Then I’ll be going on my first tour up and down the west coast. No worries though, I’ll be playing more shows around the bay before then. Business aside, I’ve always experienced the New Year as a time to reflect on the past, and also hope for the future. The first rehearsal of the year was rocky, with last minute emergencies happening to most of the band members, and it turned into more of a hang session with Harry Murphy, the person who’s been jamming with me from the beginning and encouraged me to pursue this project. It’s truly a blessing to have friends who stick with you, and even though he took a hiatus for a bit, he instantly said yes to playing with me at my last show. It was nice to catch up, our first time really since we both moved out of the same house we shared with Terrell and other close friends months back. Now, with a couple of new friends in tow, I am looking forward to the future of this music project, and the ever-expanding list of amazing people it’s brought me to. With an EP in the works, a tour in planning, and shows booked around the bay for the next few months, I’m excited for this upcoming year and what it has in store. Stay posted! After the long drought the rain’s been a refreshing change of pace. It’s time to slow down a bit and really enjoy the good things in life, and boy have the good things been happening. There’s no better time to have an intimate live recording session with some great people (made possible by Lewis Patzner). Shouldered with a guitar (me) and mandolin (Terrell) we arrived at Shipwreck Studio to be greeted by Jonah Strauss’s warm smile. I’m no studio musician (yet), and I’ve only had a few recording sessions to complete my first EP, but I can’t imagine a better experience. With just two mics each for Terrell and me plus a room mic, we faced each other as we cranked out tune after tune, all live, no dubs. I threw him under the bus a few times with some new songs in odd time which we have almost never played, and we had an oompa loompa moment bouncing up and down to keep time, but what came of it were some raw recordings that truly captured the spirit of the music. And with just a few quick clicks courtesy of Jonah’s genius, the tracks were already coming together. Will I record more tracks to possibly make a full-length? Should I also overdub some harmonies? What about adding some violin maybe? The questions are now racing through my head, but they don’t seem all that pressing as, already, true magic has happened. The vibrations were right. It’s this amazing energy that will carry us through the future endeavors to come. 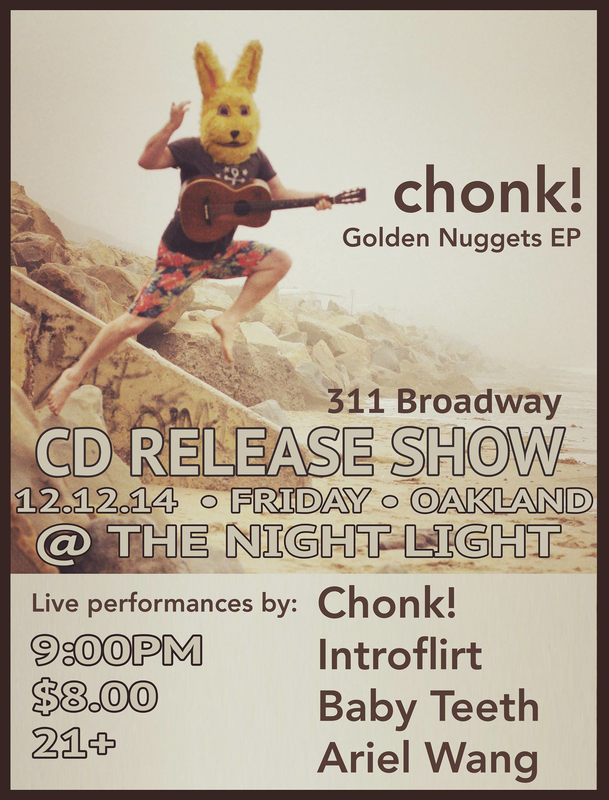 In this time of rainy days, I have coming up: a show with a full band for the first time since my EP release 1.5 years ago, in support of Chonk!‘s EP release December 12 at The Night Light. Also releasing an album is Introflirt, and my good friend from BandWorks, Kat, will be playing with her band Baby Teeth. Joining me on stage are old friends and new: Terrell Liedstrand (Forrest Day), Harry Murphy (Harry & the Hitmen, Sun Hop Fat), Nick Nirva, and Melissa Kilkuskie (Cave Clove). This will be the biggest show I’ve played yet, so come early and stay late for all the great music and hip people! 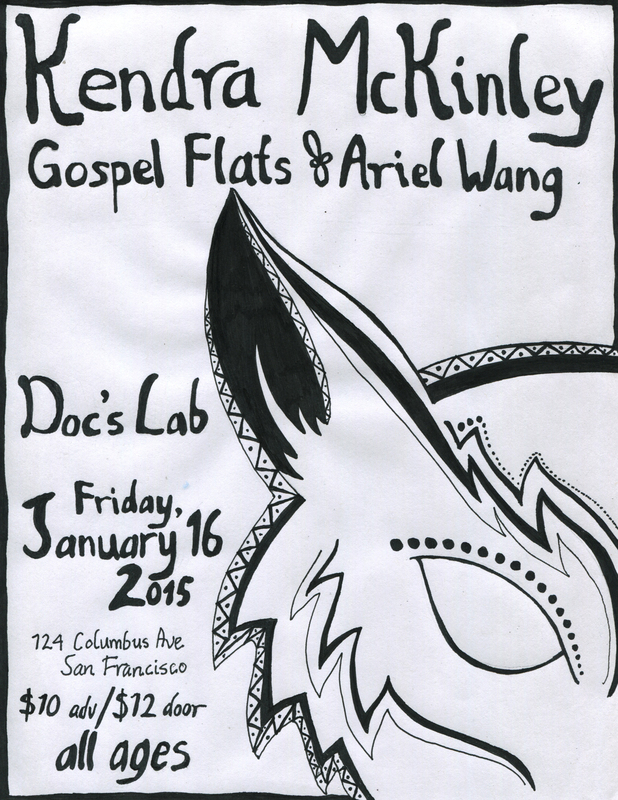 Then January 16, 2015 I’ll be sharing a bill with two good friends Graham Patzner and Chelsea Coleman (Gospel Flats), as well as the amazing siren songstress Kendra McKinley at Doc’s Lab. And after that, perhaps an album release of my own. I’m counting my blessings as I cozy in with my dearest friends and continue making music, and look forward to the exponentially more sharing and fun and love yet to come. 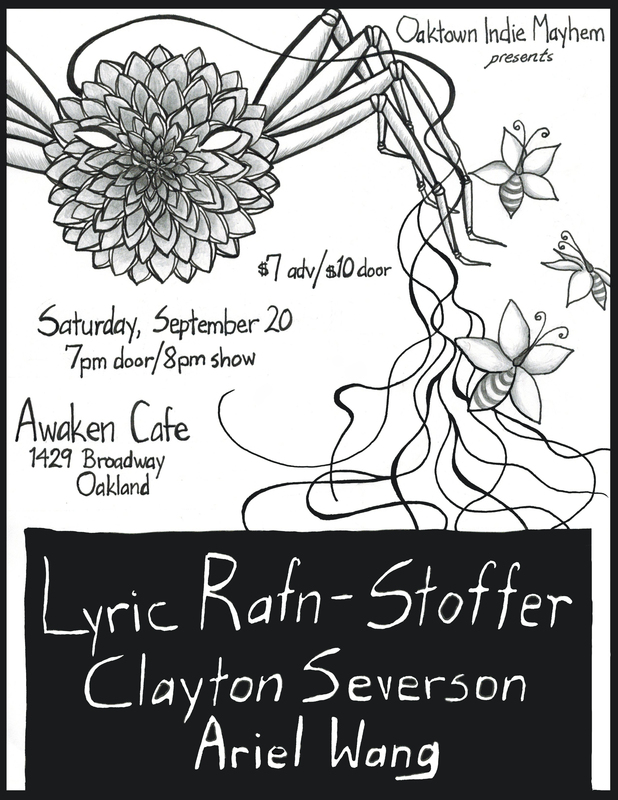 Awaken Cafe this Saturday! Last show for a little while! This Saturday, September 20, I will be having my last show for a little while. I got some exciting plans coming up…planning a new album, for one! Also got some surprises coming up in the near future so definitely stay tuned! I hope you all come join me at Awaken, one of my favorite venues. Let’s have some beer or a glass of wine, and enjoy a beautiful evening in rockin’ Oakland! I’m hosting a house show tomorrow (Saturday) so you should come on by! There will be Whiskey cocktails made by my good friend Harry Murphy, and I’ll be sharing the bill with Terrell Liedstrand (also in my band), Adrienne Shamszad, Tom Rhodes, and Paul Greene. Come on by!